There were large numbers of birds around us, but they were too far away to identify. We enjoyed watching a few large flocks of (mystery) birds swooping around in the sky, changing shape and color as they turned in different directions. Wildlife Sightings: Ah, the problem with not having binoculars. The following list is infested with question marks: 12 black-neck stilts?, 2 lizards, ~200 brownish birds (sandpipers?, godwits?, others? out a bit too far for me to see); 3 LBJs; 4 egrets + 1 large white egret? ; 1 little yellow LBJ; 1 "skipper" butterfly/moth. As I'm getting further from home, I'm running into more (mostly pleasant) surprises and discoveries that come with unknown territory. Today, I parked in the Bair Island Visitor Parking Lot, and walked on Bair Island Road (shown as two goldish parallel lines on map) toward Highway 101 and back. Then I walked toward the Bair Island trail, only to see a big closed sign. So, I strolled over to Pete's Harbor for a late breakfast (and iced water for the hot day) at the Waterfront Restaurant. Very nice. 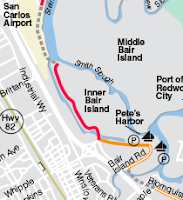 After my break, I walked back to the Bair Island sign and discovered there was a dirt trail (solid gold line on map, indicating an undeveloped trail) along the bay, which led to a bikepath/trail (a bypass trail closer to Highway 101 than shown by red line on map for Bair Lower Island). I headed toward San Carlos, alongside Highway 101, and turned around a mile or two before the Holly Street exit, and walked back to my car. Deciding I might be able to trudge a bit further, I drove up to Holly St., and parked at a public parking lot at the end of Skyway Road, crossing over into the city of San Carlos in the process. And, if I'd been more patient, I could have taken a fun photo of a small plane over my car, coming in for a landing at nearby San Carlos airport. But, it was hot (Death March Index score: 8 out of 10), and I finished today's walking by hiking back to the point where I'd stopped earlier, a short distance from a billboard (for Mrs. Meyer's cleaning products) that stated: "Always trust your nose"...an odd statement to make at low tide on the mud flats. I've gotten used to the occasional Bay smell, but it has dampened the enthusiasm of walking buddies who have joined me (and decided once was enough). Hot and thirsty after walking, I found the Milkshake Werks in Redwood Shores, and had my lunch in the form of a root beer smoothie and a cup of homemade ice cream. Until the sugar rush hit me, it was a little slice of heaven. This evening I walked the length of Blomquist St. (shown as two goldish parallel lines on the map to indicate an unimproved area, on a street), and part of Maple St. This fairly short street is home to Lyngso, Graniterock and other operations that (I'm guessing) make use of the deep water port in Redwood City; and to Malibu Grand Prix Raceway and Malibu Castle and Games. Starting half-way down Blomquist, I first walked southeast, passing the turnoff for Malibu Raceway, and continuing until Seaport Blvd. Then I turned around and walked back down Blomquist Street, passing the Malibu attractions once more, to get to the northwest end of Blomquist. Turning down Maple St., I walked as far as the Bair Island Aquatic Center, just outside Docktown Marina. At this point, I stood on my tip toes and had my only glance of the Bay in the dark. It was late enough that most pictures I took didn't turn out. Drivers that passed me must have been puzzled to see what looked like an odd homeless woman taking pictures of dirt, and/or flashes of light (from the camera). Wildlife Sightings: None. Most non-human wildlife, that might have been nearby this business street, had turned in the for the evening. You get to go out on the bay in a big boat. How great is that. I imagined some parents saying this to their kids as they were dropping them off for summer camp sessions at the Marine Science Institute (MSI - a non-profit organization founded in 1970). And, if I thought I could get away it, I would probably sign myself up for this camp. MSI had a small aquarium, a fairly large research vessel, and several small outdoor areas set-up for instruction, puppet shows, and other activities. There was even a small strip of beach, with a view of the Port of Redwood City (one of four deep water ports in the San Francisco Bay). This very nice walkway had benches, landscaping, nice bay views, and a wildlife identification sculptural display. This dog-friendly trail also had dog waste stations. Wildlife Sightings: 5 lizards along the paved pathway; and 2 friendly Burmese Mountain Dogs, Piper and Taiko. I enjoyed a blackened snapper dinner at Bella. I was seated by the window with a great view of boats going to and fro outside on the Bay. After dinner, I walked as far up and down as I could along this stretch of Bay, past a public fishing pier, and marina. Note: The pigeons and crows were munching on birdseed in a back parking lot, near a sign that said: "Do Not Feed Birds." Today I walked with a friend, Elise, down the remaining stretch of Seaport Boulevard, past salt flats and old rusted rail cars on the right, and a salvage yard on the right -- inhabited by huge machines (with "claws") chewing up and throwing around pieces of old cars (which we enjoyed watching from across the street). At the end of Seaport Boulevard, there is a large office park, Pacific Shores Center. Happily, there are designated public parking areas, a park, and public access to the Bay. We tried to walk to the very end of this peninsula (see red line above that seems to curve to the right). We went down a road to Westpoint Harbor, a new private marina (still under construction) off to the right (not shown on this map) -- which I would not recommend, as this is a no trespassing area. We were told (very politely) that we should leave. Wildlife Sightings: 9 geese, 4 egrets, 3 dragonflies, 1 little brown job (bird - aka LBJs) 150 killdeer; and 3 mechanical "claws" (think a giant version of an arcade game where you manipulate a claw-like device to try to pick up a small stuffed animal, toy or other prize object). 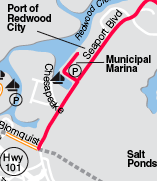 Today, I continued walking on East Bayshore Road toward the next segment of trails in Redwood City (toward the marina area). Along the way, I was careful to keep my eye on traffic and to stay on the edge of the road away from passing cars and trucks. Again, this is along an area where a trail does not yet exist (as indicated by gray dotted line in map above); and East Bayshore Road was the closest to what may become a trail in the future. 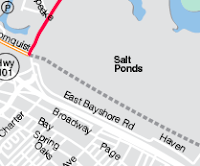 Note: There are buildings in between East Bayshore Road and the Salt Ponds, so it is not possible to see the Bay along this route. Wildlife Sightings: None. (I decided that two pet dogs being let out to do their business in a trailer park don't count.) One dead pigeon by the side of the road, on gravel and oleander blossoms, located several feet away from some memorial crosses spray-painted on the street. Yippee, I crossed into Redwood City this evening...just over the city line, according to the sign on the side of East Bayshore Road. The map (above) indicated an, as yet, undeveloped area (gray dotted line) for a possible trail in the future. I decided to walk down Haven and then East Bayshore, as close to the dotted line as possible, a route that ran parallel to Highway 101. I would not recommend walking this route, as most of this stretch lacks sidewalks. At some points I was forced to walk around parked cars, into the street with cars passing closeby. This was largely a walk through an industrial park and frontage road, with no views of, or access to, the Bay. Wildlife Sightings: 1 egret hiding in the shadows; the sound of two birds calling to each other in trees (song bird species unknown, as I couldn't see the birds); 6 ducks, 2 feral cats. Today I had a nice walk with a friend, Laura Mappin, around Bayfront Park. There is a loop trail, and other trails in this park. Near the Bay, at the North'ish end (of the service road), sat what looked like a Menlo Park sewage treatment facility. Don't eat the Bay. That was Laura's conclusion, and my advice. We each sampled a very tiny bit of salt, from a salt pond next to the trail. It was VERY salty. Then, not knowing what else had accumulated in those mounds of salt over time, I quickly wiped out my mouth. Native American Indians took advantage of capturing salt in ponds by the Bay many years ago; and commercial salt harvesting operations were in full swing a few decades ago. I remember seeing a very large white mountain of salt, which then disappeared. And now, salt pond areas are being converted back into wetlands. There are lifecycles to every life, and to every industry it seems. Wildlife Sightings: ~ 50 Canada geese; 5 egrets; 5 ground squirrels; 1 brown and white hawk circling overhead; 1 feral cat. This stretch of Bayfront Expressway had less traffic (and litter) compared with the section I walked a few days ago (approach to Dumbarton bridge), making today's walk a bit more peaceful. Wildlife sightings: 11 ground squirrels; 11 butterflies (9 were cabbage white butterflies); 2 birds (Killdeer); 2 dragonflies; and 1 large spider eating a bug for lunch in its web. Walking Distance: ~ 1.5 miles? I walked down Willow and across the Bayfront Expressway (Highway 84), hiked the trail loop around Sun Microsystems campus, then walked along Bayfront Expressway to the intersection with University Ave. (where I ended yesterday's walk). I then walked back to parking lot on Willow Rd. The days are definitely growing shorter; it was getting dark by the time I got back to my car. Wildlife sightings: 1 dragonfly, 1 feral cat, 5 doves. 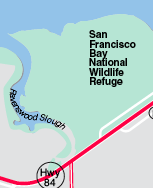 The Ravenswood Open Space trail along the Bay on this map (nearest Dumbarton bridge and Ravenswood Pier) was closed (until 2011) due to salt pond restoration work being done. So, I parked in the Dumbarton Bridge parking area and after walking over to look out onto the bay and under the bridge, I walked on the bike path along Highway 84, along the salt ponds, and down University Ave. (shown as double red line on map); then I walked back to the parking lot. The path (grey dotted line on map) linking the Ravenswood trail (further south) that I walked yesterday was also closed to the public. Wildlife sightings: None (with the exception of some birds far away on the bay). Unfortunately, this route along the highway was not all that conducive to living things. I do remember seeing 1 hubcap, many cigarette butts, pieces of broken glass, miscellaneous clothing items, a belt, a few single gloves, and a nametag, among other items along the path. And there were underground telephone lines (buried underground and marked with an occasional metal grate) along the same route. The little salt flats and salt slushpiles several yards away were interesting to look at, but I could see no life in them from where I stood. This morning I finished the trail I had started yesterday at Ravenswood Open Space Preserve. At the end of the trail was a nice observation platform, that made for a nice quiet stop, with a view of the Dumbarton bridge just to the north. Unlike late yesterday, when I was being pelted by dust specks in the wind, it was calm this morning, making it easier to see and hear birds, insects and other signs of life. I looked for a trail heading back toward University Ave. (grey dotted line on map shown), but didn't see anything like this. A trail like this would come in handy for my next segment I plan to hike. But, the next few miles look a bit iffy. Wildlife sightings: I heard a few songbirds at the beginning, and spotted several small swift or swallow-looking birds darting around. Naturalists, my apologies, I'm learning about the wildlife right now. Other than that, I spotted two egrets flying a ways off, and just a few flowers and insects (a dragonfly, some tiny butterflies, a strange looking bee) this morning. Just a soft buzz of electrons from the transformers I was walking next to....otherwise, it was nice and peaceful. Cautionary tale: On the drive back home, while stopped at a stoplight, the car in front of me slowly rolled backward until it hit my car. In talking to the young woman driver a few minutes later, she explained that she was wearing flip-flops (sandals like I'm wearing to hike around the bay), and she'd had some kind of malfunction while trying to take one of her flip-flops off (or trying to put one on, I'm not sure which), which prevented her from stepping on the brake and halting her roll backward. In her defense, she was only wearing the flip-flops because she went out last night and was wearing high heels, which irritated her foot, and thus caused her to wear flip-flops this morning. Hmmm. I'm not sure I get it; but she was nice, and apologized for the trouble. This evening, I drove through East Palo Alto, and parked at the end of Bay. I then back-tracked to finish the last little bit of yesterday's hike (which was supposed to finish at Bay Rd./Cooley Landing parking area). And then I returned to parking area, and starting heading north. It was breezy. Maybe this explains why there wasn't any birds or other wildlife about. It didn't help that a large speck of something blew into my left eye, and I was busy keeping that eye closed and trying to walk along as if nothing had happened. But, I spoke to some nice folks along the way, including a family that may have been doing some geo-caching (finding objects). This morning I crossed Palo Alto into East Palo Alto via Geng Rd. (off Embarcadero), and hiked toward Bay Road. There is something surreal about walking down an elevated path, and having two different worlds on either side of you. As I walked north, on my left side, was East Palo Alto, a modest suburban neighborhood, and high-crime area, with bars on windows and barking dogs (and one screeching parrot) on one side of the path, and, on the other side -- an immaculate, green golf course, with three lads playing there without a care in the world (where their biggest frustration and the occasional f-word was directed at a bad golf swing). Some small differences on this section of trail: more spray paint/tagging and more dog poop. Wildlife spotting: more egrets, ducks, Canada geese; another pheasant; two black-crowned night herons that looked like they were hunting as a pair; some small black-and-whites (black-necked stilts); and lots of white-shelled snails hanging onto tall blades of dry grass along the way. Below is a link to an image of some black-crowned night herons. This evening I hiked the loop starting from the Lucy Evans Interpretive Center parking lot. 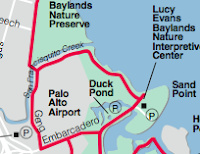 I hiked northwest-ish along the bay, around the Palo Alto airport and golf course, and then across on Geng, and down Embarcadero, past the duck pond -- and back to the Lucy Evans parking lot where I started. I'm guessing this loop may have been between 3 and 4 miles in length. It took me an hour and 20 minutes to complete. Along the way back, I saw a beautiful pheasant pecking at something on the side of the road (the first one I've seen alive, and not stuffed in a museum); three white egrets; and many ducks, Canada geese, and other birds too numerous to count. There was a nice sunset to the west, and a moon rising in the east as I finished this walk. As stated previously, I will miss these long summer days, that make these evening walks possible.